Welcome to Three Lakes Elementary School! We believe all children deserve a first-class education, and we strive to make each student a life-long learner. Check back often for more news and happenings! This past spring, the district made some changes to the filtering products used on school-issued devices. A product called Securly was installed, which allowed for continuous filtering of school Chromebooks, whether the devices were used at school or at home. This meant that restrictions in place at school continued to be in place at home or anywhere the school devices were used. Although schools have always been required to filter objectionable content on school networks for student safety, this approach made filtering specific to device rather than location. As we begin the 2018-19 school year, the district has added GoGuardian, a tool that lets teachers monitor screen activity while in the classroom. This addition will give teachers the ability to see thumbnails of student screens while working in the classroom. Although these filters add some level of safety, parents and guardians should remember that nothing is totally effective. Therefore, we remind you to continue to monitor your son or daughter's technology use at home. We're also excited to announce that we'll be adding cellular-based Wifi to our school buses this year. This limited wireless service will permit students to complete homework while traveling for school activities. This addition will be activated in the weeks to come, and we'll include another update at that time. As always, please contact the school with any further questions. It's Time for a Flower Sale! The Three Lakes Special Education Dept. is holding its annual flower fundraiser. The sale will go through May 16, and orders will be delivered on May 23. Just click here to download the order form, which can be returned to the elementary office. Or, stop in to see Ms. Maney to place an order. Flowers are supplied by Hanson's Garden Village in Rhinelander. Choose from marigolds, petunias, impatiens, geraniums, pansies, Vinca vines, German vines, asparagus ferns and Dracaena spikes. Breakfast with Books included some time to read together. Sitting down to read with your student - even if it's just five minutes a night - is incredibly important. That's the message the Three Lakes teacher staff wanted to get across during the annual Breakfast with Books on Nov. 17. The event is an opportunity for 4K and kindergarten students and their parents to learn about the importance of reading ... all while enjoying a light breakfast together. Each student received a free book during the event. 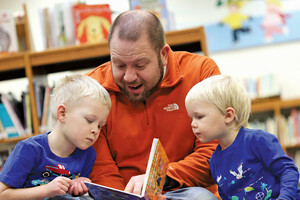 After the reading presentation, parents had a chance to sit down in the library and read with their students. The 1st graders send a big hello to Houston. 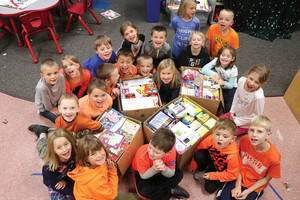 The Three Lakes first graders sent a little love southward this week as they packed up several large cardboard boxes full of pencils, markers, notebooks and more. For the past few weeks, the students have been busy collecting school supplies for an elementary school in Houston that was affected by hurricane flooding. Throughout this project, the emphasis has been on kindness, and it shows in the attitudes of all of the kids in Mrs. G's class. "We show kindness because it makes us feel good, and it makes the people we're helping feel good," the kids said when asked about the supply drive. Four boxes of supplies are now headed to Worsham Elementary. 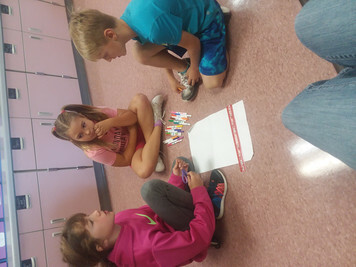 Originally, the Three Lakes students were just hoping to send supplies to Worsham third graders because their teacher is a friend of Miss Gohl, the Three Lakes 4K teacher. However, because the drive was so successful and so many students participated, even more students in Houston will benefit. 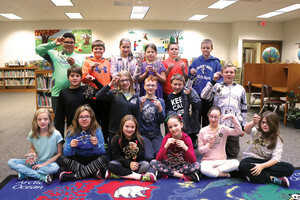 As the holiday season approaches, students at Three Lakes Elementary have been busy crafting ornaments that will decorate the 2017 Capitol Christmas Tree in Madison. This year’s theme — the Capitol’s 100th Birthday — was the inspiration for the students’ glittery creations. Each year, Gov. Scott Walker’s office invites students from around the state to submit ornaments for the tree displayed in the State Capitol Rotunda. The handmade ornaments — crafted by students from around the state — are enjoyed by thousands of visitors every year. This year, the Three Lakes ornaments were made by cutting sections of toilet paper rolls and forming them into intricate snowflakes. A little bit of glitter, and the ornaments are now ready to be sent to their home in Madison. You can see more ornaments from around the state by searching for the hashtag #WICapitolTree on Facebook and Twitter. And, you can learn more about the Capitol’s 100th birthday by visiting capitol100th.wisconsin.gov. Did you know Three Lakes Elementary can earn money and prizes from your garbage? Terracycle is a program that takes hard-to-recycle items and turns them into useful items. Now, you can recycle daily disposable contact lenses, blister packs and top foil through the Bausch + Lomb Terracycle program. Just drop your contact lens products off near the elementary office. To see what else you can donate/recycle, visit the SCO's Terracycle web page.